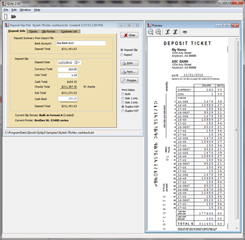 Qslip also prints deposit information on your own pre-printed deposit slips - including 2-side formats. You can either enter the information directly into Qslip, or Qslip will read Deposit Summary export files produced by QuickBooks or generic CSV format exported from other applications. Information for Qslip 1.60 (and earlier) is available here. Qslip is a 32-bit application (as is most current software). However, it can be installed and run normally on both 32-bit and 64-bit versions of Windows.